Mark Blelock, Dairy Council for Northern Ireland Chairman; Professor Paul Ross, APC Microbiome Ireland, University College Cork; Professor Helene McNulty, Ulster University; Professor Sean Strain, Ulster University and Dermot Farrell, Vice'Chairman Dairy Council for Northern Ireland. Professor Paul Ross from University College Cork delivered the 29th annual Dairy Council for Northern Ireland (DCNI) Nutrition lecture at Ulster University which focused on ‘Human Microbiome Solutions to Fight Infection and Prevent Disease’. 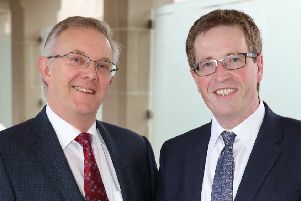 The annual lecture represents long-standing co-operation between Ulster University and the Dairy Council the purpose of which has been to provide a forum for world class research to be presented in key areas of human nutrition. Speaking at the event Professor Ross said: “The human microbiome consists of a complex population of trillions of microorganisms including bacteria, viruses, and fungi that live in the human intestine. It is established from birth where it has a profound impact on early infant health and indeed probably in later life. “At APC Microbiome Ireland we are adopting a number of strategies to influence the microbiome towards improved health outcomes. These include the use of specific dietary interventions ranging from dairy ingredients to complex carbohydrates to novel antimicrobial strategies.